Grant has up until a few nights ago been a pretty decent sleeper. He takes good naps during the day and goes down easily at night. For the past couple of months, he is still waking up between 4 and 6 to nurse, but he usually would always go back to sleep without a fuss. While I'm ready for him to sleep till the morning, I can typically handle one feeding in the middle of the night and feel pretty rested the next day. Starting three nights ago, Grant has been waking up between 4 and 6 and deciding he wants to stay awake and be social after nursing. At 6:00 a.m., that is an acceptable request even if it is too early for me. At 4:00 a.m., it is not acceptable. I am totally on board with letting him cry it out except I have a sleeping child who shares a wall with his squeals and cries. Another issue is that he is rolling onto his stomach and can't roll back over to his back. So if this happens he for sure will cry out loud. Last night, I nursed him at 4:15, rocked a few minutes, and put him in his bed. He immediately started babbling and squealing. He is not crying; he is just awake. After about 20 minutes, I go back and do the same routine and again 20 minutes later where he did fall asleep. By now, it is 6:00 a.m.
Thankfully Laura didn't have to get up for school, so I could continue to sleep till Jim left for work. BUT, I do not want to start bad habits and I certainly don't want to be up for two hours each night. Should I just let him babble, squeal and cry and not worry about waking Laura? Any advice is appreciated!!!! Let him talk it out! He'll do that for a few nights and finally realize you are not coming back in. Nora and Elyn had to share a room this weekend and everytime Elyn would call out (she's teething) I would rush in because I didn't want her to wake up Nora. I am so glad that we get to go back to normal tonight and I can let her get herself back to sleep. All of that to say, you stay in your bed. Good luck! I would agree...he's got to get it out of his system and learn that it's not going to help. Even if that means disrupting Laura's sleep for a couple of nights. With any luck, she'll just sleep through it anyway...that's what Will did when we went through this with Sam. (They were in separate rooms at the time.) Even now that they share a room, though, Sam can wake up crying at the top of his lungs and Will will sleep right through it. Amazing! I suppose it depends on the kid, though. BTW, is that Grant in that adorable picture?? 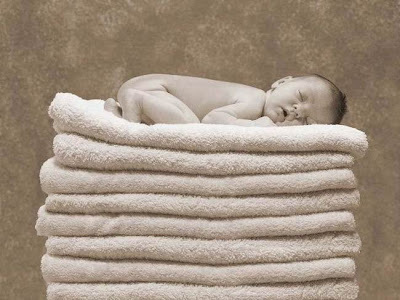 That is a GREAT shot...it looks like an Anne Geddes. Very sweet! Babbling is one thing, screaming at the top of his lungs is another! I never wanted 2 awake at the same time, so if he was screaming hysterically, I would go get him. But, if he is just kind of talking, you could let him go and see if he goes back to sleep on his own. Leave him!!! He will fall back asleep and my experience has been that the others don't wake. This is just my thoughts - let him babble/scream/cry it out while running a large fan in Laura's room to drown out the noise?????? I don't have any good words of wisdom, but I feel ya on babies getting up too early!! Sydney was doing so well sleeping till 7:30 or so, but for some reason the last couple weeks she's been getting up at 6!! I know it's technically morning, but it is way too early for me! For us, we would wait till the weekend (so Drew wouldn't be extra tired at work) to let Sydney cry it out, and really it only lasted a few nights before she was sleeping through. Keep us posted on yall's progress!! I'm NOT the one to advise you on this because I was never tough enough on my babies. I could never let them cry it out. My punishment? Alec (3 years old!) still awakens in the middle of the night at least two or three times a week. So, listen to these other mommies!